Elegantly designed to resemble an open lotus flower, the ArtScience Museum is representative of Singapore’s recent drive towards the construction of attractions boasting ultra-modern architecture. The museum is part of the iconic Marina Bay Sands (MBS) and boasts a constantly changing retinue of touring exhibits, which have included Dali: Mind of a Genius and another entitled Andy Warhol: 15 Minutes Eternal. 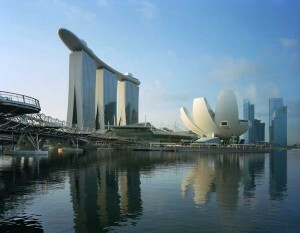 While the Singapore Art Museum and the other local galleries primarily aim to promote up-and-coming Singaporean and Asian contemporary art, the ArtScience Museum is arguably Singapore’s ‘blockbuster’ museum, usually hosting the work of established, world-renowned artists like Dali and Warhol. There is also a permanent exhibition known as the ArtScience Gallery, comprising of three sections: Curiosity, Inspiration, and Expression. The permanent exhibition displays objects and artefacts that attest to the artistic and scientific accomplishments on humankind through the ages. The exhibitions showcased by the museum have not been limited only to artwork; previous touring exhibitions have also included sets and costumes from Titanic and Harry Potter, as well as historical artefacts from Genghis Khan’s Mongolia and Tang Dynasty China. The ArtScience Museum is located next to MBS, so the easiest way to get there is by taking the MRT to Bayfront, Promenade, or Marina Bay station and walking towards the resort. The admission fee is usually dependent upon the exhibitions that are being showcased at the museum during your visit. Tickets can be purchased through the museum’s online ticketing system or at the door. More information is available at the ArtScience Museum website here:http://www.marinabaysands.com/Singapore-Museum/.